It's summer and the Peachey family is in crisis - again. Youngest child Betty Peachey is trying to persuade the family to go to the Faraway Campsite of Ma Peachey's idyllic dreams. But most of the Peacheys are still resisting. 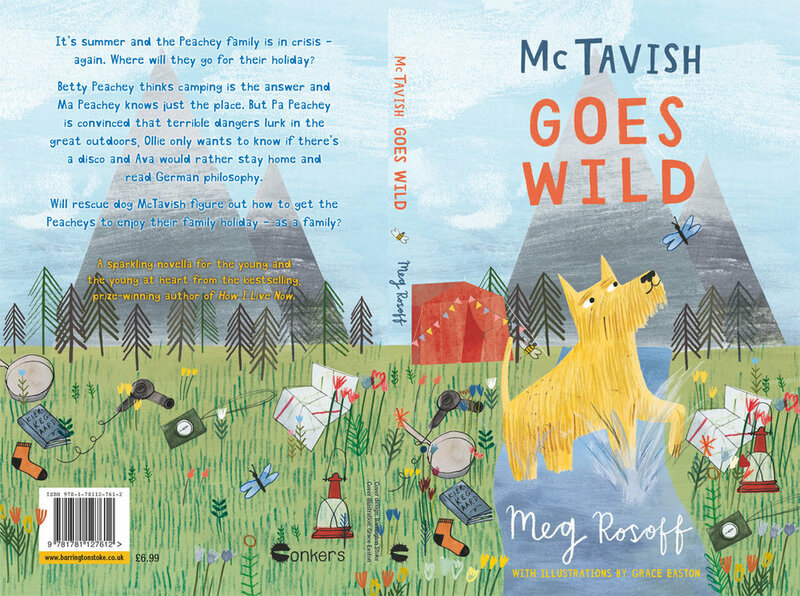 Pa Peachey is convinced that terrible dangers lurk in the `wild', Ollie only cares about whether there's a `disco', and Ava has her nose deep in philosophy books...But marvellous McTavish, always one step ahead of the Peacheys, quietly works out a way to get the family enjoying their holiday, together. Betty Peachey opened her eyes. She could hear birds singing. She could see sun shining. The air felt warm. Outside her window, bees buzzed and flowers nodded in the breeze. She listened carefully. There was no shouting and no rushing about. No one was pounding on the bathroom door or stamping down the stairs. There was no smell of burning toast from the kitchen. In the next room, her brother was still asleep. In the room next to that, her sister was reading the works of a German philosopher whose name no one could spell. Downstairs, Betty’s parents ate breakfast and read the newspaper. The house was quiet except for the sound of turning pages and munching. Summer! Betty thought. The first day of the summer holidays is the happiest day of the year. Even happier than Christmas. Lying in her bed, with the sun streaming in through the window, Betty sighed. I must be the happiest girl in the world, she thought. Lying on his bed under the stairs, McTavish sighed. I must be the happiest dog in the world, McTavish thought. For there is nothing a dog likes more than to have his entire pack all gathered together peacefully in one place. McTavish had made a great deal of progress with the Peachey family since deciding to rescue them, but they still required hard work and patience. Pa Peachey could be extremely stubborn. Ollie Peachey could be argumentative. Ava Peachey tended to read too much German philosophy and come up with too many theories. Only Betty Peachey and her mother were the sort of calm, sensible, well‐behaved humans that dogs prefer to share a home with. Training the Peachey family had been slow and difficult, but he was an intelligent dog and was up to the job. 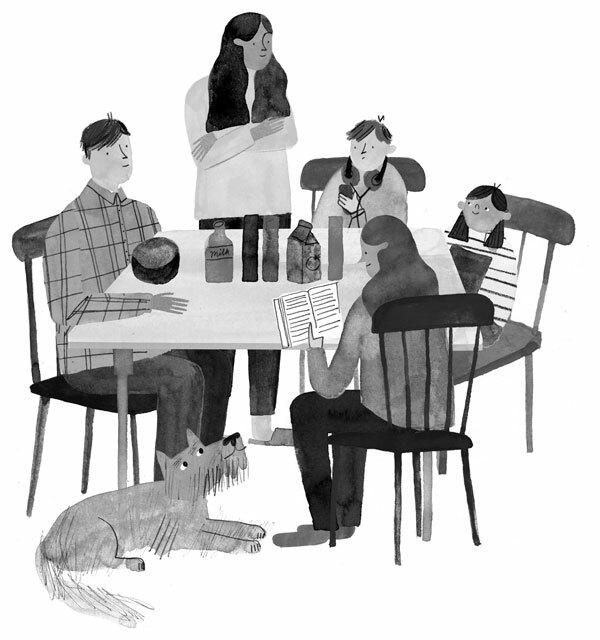 He understood that a family with an uncertain and chaotic past could not be fixed overnight. With a combination of love, patience and consistent handling, he had helped the Peacheys become far more organised and relaxed than when he had first decided to rescue them. But there was still a long way to go. “I would like to go to a place with loud discos every night so I can meet many beautiful girls who will want to be my girlfriend,” said Ollie. At last she took a deep breath. “CAMPING?” The Peacheys were aghast. “Camping? With horrible creeping crawling biting bugs?” said Ava. “Camping? With poisonous snakes and rats and killer moles?” said Pa Peachey. There was a long silence during which the Peacheys gaped at Betty. McTavish crept out of his bed under the stairs to listen. Everyone looked at Pa Peachey. For a long moment, none of the Peacheys said a word. Everyone looked at McTavish, who wagged his tail. In his opinion, this was the best argument in favour of camping. He walked over to Betty and lay at her feet. Well, not actually at her feet but on her feet. Pa Peachey shook his head. “This flirtation with nature is a travesty,” he said. “It will all end in tears.” But nobody paid much attention, because that is what Pa Peachey always said, about practically everything.